The easiest invoicing software on planet earth? Create invoices, quotes, orders, packing lists and even business letters with ease! edooli is a super simple online invoicing software. Maximum simplicity, full power! Super easy but powerful online invoicing software for small and medium sized business. Register for a free 30 days trial version, now! We wanted to build the easiest invoicing software on planet earth. With our experience of 19 years in building business software we know how hard it is for entrepreneurs, startups and small companies to find a business software that really fits. edooli is a cloud-software. So there is no need to install it locally on your computer but you can access your data from everywhere where an internet connection is. edooli is fully responsible, which means that you can use it on any device - on a computer, a tablet-computer as well as on your smartphone. So all you need to use edooli is an internet connection. Register now for a free 30 days trial version to see this revolutionary software live in action. edooli is build for all countries within the european union. The tax rates of all this countries are stored within the software and will always be up to date. All you need to do is to select your country in the settings. Perfect invoicing. But not limited to it! 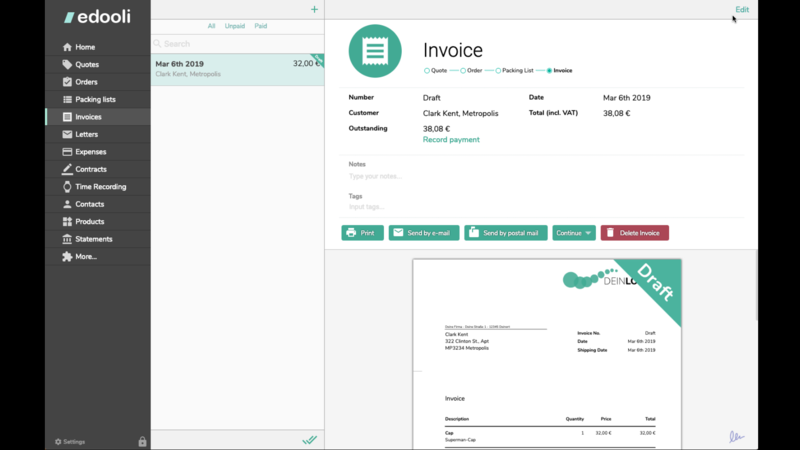 Beside invoices you can create quotes, orders, packing lists and servicereports with edooli. With ease you will be able to continue any transaction to the next step, for example creating a packing list based on a quote. edooli – maybe the easiest invoicing software on planet earth!